What started as a grey and uninspiring morning, with a dampening accompaniment of light rain was the background to an interesting and thought-provoking series of talks at this year’s Spring Meeting. The venue was Millet’s Farm Conference and Banqueting Centre at Frilford, some eight miles to the south west of Oxford. This site houses a thriving combination of a farm shop with restaurant, garden centre and leisure park. We met in a series of rooms above the shop, running from a bar area through the presentation and seating hall, beyond which, separated by a partition, was a well laid out dining room. A brooding peacock balefully eyed the proceedings from its perch on the adjacent terrace. David Sangwine, as chairman, welcomed us and introduced the speakers: Jim Lyons, Bob Sephton and Peter Taylor. Jim Lyons opened his talk with the warning that Dudley Wheeler had banned him from talking about his “Theory of the Universe” and he was to be restricted to more mundane matters. In Douglas Adams’ “Hitchhiker’s Guide to the Galaxy” series of books there is a quest for the answer to “Life, the Universe and Everything”, so to be confined to “Life” and “Everything” didn’t seem to be too harsh. That earth Energies belong in the latter is indisputable, but the former . . . ? Before he got down to that we heard that last year Jim had teamed up with Hamish Miller and others to produce the first in what might develop into a series of videos about stone circles, entitled “The Spirit of the Serpent”. Jim started his talk proper by observing that dowsing is a quantitative activity; it is all related to bio-physics and closely related to geo-physics. The numbers in dowsing are extremely important and have to be got out because “all this has to be related to mainstream science”. His observation that the subject, dowsing, is part of mainstream science – but scientists don’t know that yet – brought a considerable degree of amusement. Every object in the universe creates a ripple pattern around it, which goes on for ever; there are two series of rings, one arithmetic and the other logarithmic. We were taken on a journey through the geometric, mathematical and harmonic relationships which determine the resultant fields, their shapes and properties. These relate throughout the universe, in galaxies solar systems, their planets and even to the rings around these. We were introduced to Torsion Field Theory, a subject which has been studied in Russia for some years, but virtually ignored in the West. (For more on this, see Jim’s article in the last – March 2004 – EEG Newsletter). The essence of this is that the spin of a body affects its energy field, and its interaction with the fields of other spinning bodies. When applied to the planets it leads to some of the effects noted at the times of the solstices, equinoxes and eclipses. We were led through musical and diatonic scales, spirals, logarithmic and arithmetic, those of galaxy shapes and snail shells, and on to tetrahedral geometry and the two tetrahedral shapes within the earth, whose bases touch the surface above and below the equator at a latitude of 19.471º . This angle – known in BSD circles as “Bob’s Angle” – has been found to occur widely in natural phenomena as well as stone circles. The interactions of these different geometries of energy gives rise to various grids on the earth: Hartmann, Curry and the less well-known Cathie grids were mentioned. 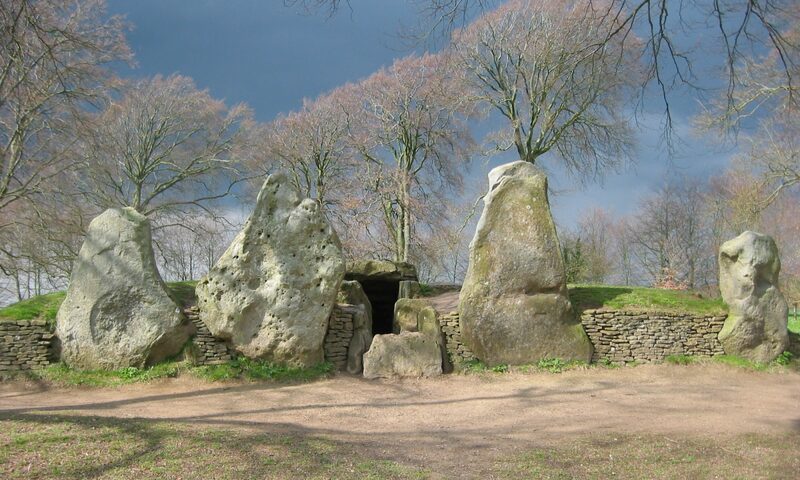 Ancient sites always occur at cross-overs of energy lines, and contain grids within grids within grids… Standing stones adjust their amounts of energy to balance with the stones next to them; the sizes of the auras can touch tangentially or the aura of one can pass through the centre of the next stone. Where these energies are not in balance can be detected by sensitive people. The out-of-balance stone in a circle being constructed by Jim, Billy Gawn and others in Northern Ireland was described by a passing lady as “not happy”. The auras were measured and found to move in and out over the two days or so it took for equilibrium to be achieved. He went through the geometry which led to spheres of energy giving rise to tangential energy lines of alternating directionality, and how, by sitting quietly in the centre of a circle one could sense its frequency of vibration. On crop circles, while confessing to having been trying to give them up for ten years, Jim admitted that, like most addicts, he was always getting tempted to take a “quick nip into one every now and again”. They were the visible result, he said, of “bubbles” of energy from underground water rising through the surface of the earth, and showed photographs of the bubbles created by whales spouting underwater breaking the surface to give rise to the shapes seen in crop circles. He also showed slides of the beautiful patterns that can be generated on drums by the application of various frequency tones. Douglas Adams “Answer” to Life, the Universe and Everything was 42; so with the ratio between dowsable rings being 0.891, multiplied by what factor of Bob’s angle and the appropriate harmonic ratio……..pass Carol Voderman over, would you. First and foremost, it is up to each of us to find our own way. That we are not the sole intelligence acting and it is far better to include and listen to the murmurs of higher consciousness, “Management” or whatever one chooses to call it. To be wary of making adjustments to energies off one’s own bat; much better to ask “Management” to do so as there may be other factors in play beyond our awareness. Reversals of signal (“Yes” / “No”) can happen very suddenly; that it is very important to check one’s signals frequently. To be aware that when a group is dowsing a single object it is quite possible to pick up – and be confused by – the signals from others. He offered a variety of methods of making do with, and various ways of deviceless dowsing where appropriate. He strongly advised us to make notes, and to keep a record of one’s results. He told us of occasions when his “May I?” had given a negative response, in one case preventing him from entering a site. Further enquiry showed that his dowsing would have interfered with a flock of birds which was gathering overhead prior to migrating. When dowsing a site at various periods, he suggested the use of cards, where the date under investigation is written down and physically placed on the ground. He has found this can be a great help in maintaining a focus. If marking out a site, he gave a warning never to use metal pegs with a metal hammer, as the ringing could obliterate any signal in the ground. When dowsing by counting to determine a figure, he suggests that we always go beyond the result and come back as a worthwhile confirmation. He told of an experiment he tried one afternoon whilst watching a politician being interviewed on television, and attempting to use the rods to detect how truthful his answers were. The swings to and fro were apparently fascinating to behold! After lunch Peter Taylor related some of his experiences as a (now professional) water dowser, starting with his early attempts to find a spring for his fishing club. That he embarked on the digging of six-foot deep holes with a pickaxe showed how important enthusiasm can be; especially when nothing is found. He discovered the hard way that he was picking up a series of “reaction” lines as well as the true water line. Subsequent digging led to success: perseverance pays. He demonstrated the tools he uses and the reactions he obtained with a “Y” rod constructed using two pieces of heavy-duty plastic section were so strong that they have only a short working life. Peter is very much a self-taught dowser who uses what he has found works well for him. He uses “witnesses” to give focus to his searches, whether for water, gold or oil. He told us of his experiences with dowsing for a major oil company and the warning that when dealing with big business it pays to take a much more business-like approach. As a professional dowser, he found that becoming a company brought distinct benefits. He showed us some of the correspondence from businesses he had dealt with complimenting him on his successes. He also passed on his experiences with finding water in volcanic areas and correcting for depth errors where water lies beneath layers of clay. The afternoon concluded with a short session of questions and answers.